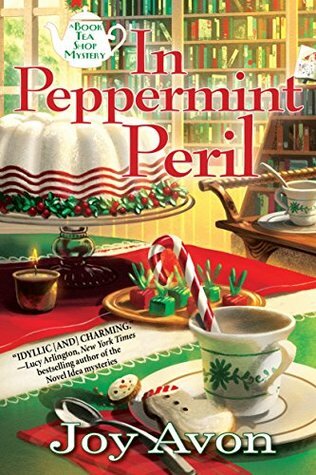 In Peppermint Peril by Joy Avon – Books, Books and More Books! Callie Aspen is taking a break from guiding tourists to exciting and historic places around the globe. She has come back to visit and help out at Book Tea, a vintage tea room where all of the goodies have some sort of book clue in them. And they sound scrumptious! It doesn’t hurt that her aunt owns the place! It’s a snowy Christmas time in Heart’s Harbor, Maine, where Callie spent so much of her childhood and fell in love with Haywood Hall and it’s inhabitants. So it is a treat for her to help her aunt with a themed tea at the Hall at the behest of the owner, Dorothea Finster. Unbeknownst to Callie, every guest has some kind of agenda. Is the elderly Dorothea going to read her will? Is the Hall going to be sold? And why is the gardener lying dead with a screwdriver in his chest? This is the first in the series and I enjoyed each and every character. The pace of the book was just right for me. I can’t wait to see what happens next with all of these lovely characters! A THOUSAND DOORS, AN ANTHOLOGY EDITED BY J.T.ELLISON RELEASE DAY! You had me at Boston Terrier! Great Review. Nice review. I was not sure about this one as others have said there are too many characters to connect, I shall see. I did read that too. For me it wasn’t hard but give it a go! I have it ready to go soon, during my Christmas Reads. Glad that was not an issue for you.